The 2017 DCSD All-Star Soccer Classic teams are set for the Thursday, May 18 games at Adams Stadium in the seventh annual event. This year’s format is slightly different as the coaches went away from the Outside-the-Perimeter vs. Inside-the-Perimeter alignment in hopes of making the games more competitive and exciting for the players and fans. The girls’ game is scheduled for a 6:00 pm start with Team Green taking on Team Pink. Martin Luther King Jr’s Vincent Gatling is coaching Team Pink with representatives from Chamblee, Clarkston, Cross Keys, Lithonia, M.L. King and Tucker. Gatling has some excellent scorers to work with on offense led by Tucker sophomore striker Anna Lippy who is tied for third in goals in DeKalb with 31. Joining here are Clarkston junior Palma Tamang (29, tie for 5th) and Chamblee senior striker Kamilah Mustafa (28, tied for 7th). Cross Keys junior forward Andreana Valezquez and Tucker senior striker Tierra Moore both have 19 goals on the season. King’s Nina Shaw has 22 assists, good for third in DeKalb and Mustafa has 15 (tie for 5th). 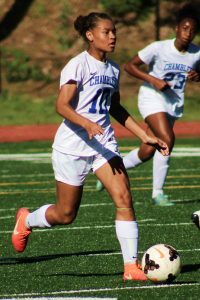 Chamblee senior goal keeper Lindsay Wilson is 7-3-2 on the season and second in goals allowed average at 0.76/game. Team Green has representatives from Arabia Mountain, Cedar Grove, Druid Hills, Lakeside, Redan and Stone Mountain. Druid Hills Katy Cochran coaches Team Green and also has some prolific scorers to counter with against Team Pink. Arabia Mountain senior forward Danielle Dean is second in DeKalb in scoring with 40 goals and has 21 assists. Redan freshman Amadai Veasley is tied for third in goals with 31 while senior teammate Karen Depaz-Veliz has 29 goals and leads DeKalb in assists with 31. Lakeside’s duo of goalies lead the way in the net as seniors Kenzie Kilgallen (1.99 goals/game) and Miranda McNalley (1.48 goals/game) are fifth and third, respectively, on the DeKalb charts. The boys’ game is set for an 8:0 pm start at Adams Stadium following the girls’ game with Team Blue taking on Team White. Team Blue is coached by Lakeside’s Robert Richmond with help from Maxo Vendome of Towers and Cameron Heyen of Tucker. The team has representatives from Columbia, Cross Keys, Lakeside, Lithonia, Martin Luther King Jr., Towers and Tucker. 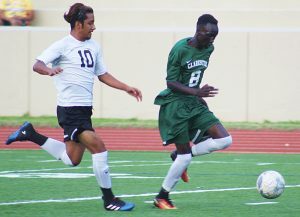 Sophomore Eduardo Dimas of Cross Keys had a big year for the Indians with 19 goals (3rd in DCSD) and a county leading 29 assists. Towers senior striker Kangni Bavon also scored 19 goals while Lithonia midfielder Bill Jackson had 17 goals. Martin Luther King’s senior striker Samuel Lamptey had a county leading 25 goals and joins the other solid offensive players on Team Blue. Lakeside’s Alfonso Bautista is set to be in goal. He has played 1,030 minutes in goal this season and has allowed 1.32 goals/game. Team White is coached by Andrew Goodman of Clarkston along with Thomas Bodnar of Druid Hills. The has representatives from Arabia Mountain, Cedar Grove, Druid Hills, Clarkston, Redan, Southwest DeKalb and Stone Mountain. Clarkston senior midfielder Mohamed Tambadu leads the way with a DeKalb second best 22 goals on the season while teammate sophomore forward Jeremiah Louma added 15 in the Angoras run to the Class 5A state championship game along with Cedar Grove senior Manyang Taal. Druid Hills’ senior midfielder Luke Narker has contributed 14 goals in the Red Devils run to the Class 4A state championship game. Team Blue has the top two goal keepers in DeKalb in Druid Hills senior Josh Lloyd and Clarkston junior Bismark Dansou. Lloyd is atop the goals allowed category at .80 with 1,508 minutes in goal and 99 saves. Dansou is second at 0.90 goals/game in 890 minutes of action.